When I first started teaching eighth grade math, I would see students get back their quiz, look at their score, MAYBE flip it over to see where they lost points, then slide it into their folder – perhaps never to look at it again. I knew I had to do something to help my students learn to be more reflective about their progress. I wanted my students to take ownership of their work and learn from their mistakes. Over the past few years, I have incorporated several strategies that I believe are helping to facilitate the development of reflective learners. Three of them are shared here. After each quiz, students fill out an evaluation and complete corrections on the problems where they lost points. On the evaluation, students identify a strength and a challenge from their quiz. (I stopped using the word weakness a long time ago. Challenges can be overcome!) The strength and the challenge could be a particular concept or a general skill like checking over work or studying. Then students set a SMART goal. I use this term loosely in this context, although I do talk to students about thinking about a goal that is Specific, Measurable, Action-Oriented, Rigorous, and Timely. They identify something they would like to achieve and state one strategy they will use to get there. Once students have reflected on their overall achievement, they focus on the details of the quiz. For each question where they lost points, they fill in a chart with the problem number, topic, number of points lost, and then they check off whether it was a simple error or something they don’t or didn’t understand. For each of these problems, they either redo the problem again or they write a sentence describing their error and what they should have done. This process is worth the effort! I rarely see students make the same mistakes on the test that they did on the quiz. I give students two nights to complete the assignment, but we also have an Advisory block built into the day so they have some time in school to work on this as well. By popular demand, my Quiz Evaluation is now available as a document in my Classroom Forms pack. As teachers, we are constantly evaluating our students’ knowledge. We ask questions, give exit tickets, use whiteboards, listen to discussions, etc. It’s also important that our students are assessing their own knowledge and understanding on specific topics. Often times I ask students to quickly rate and share their level of understanding with me using hand signals. I will pause during a transition in the lesson and ask students to rate their comfort with a topic from 5-1. 5 fingers represents a strong understanding of the topic and 1 finger represents feeling completely lost. This strategy is multi-purpose. Students assess themselves and reflect on their understanding. They are also able to deliver a quick, silent message to me, indicating how they are feeling about the topic. As the teacher, with a quick scan around the room I can quickly see if I can move on, if I should readdress a topic, which students I need to check-in with in a small group for remediation, which students need some challenging practice, etc. A variation of this that I will occasionally use is thumbs up, down, or sideways. In this case, students are still assessing themselves, but it’s also a great quick check to make sure students are paying attention to the lesson. When differentiating for my middle school math students, I often provide “Choose Your Challenge” activities, meaning I provide two levels of practice of a same topic. Students select based on their level of comfort with the material we are practicing that day. One level will typically be aligned with what we have been doing in class, and a second level will be a bit more challenging for those students who are ready to extend their understanding of a topic. When I first started offering these assignments, I was concerned that students would not select the correct level for themselves: either too easy or too hard. Occasionally I have to redirect a student to a different assignment, but it is amazing to see their appropriate selections. I think a lot of this stems from how the options are introduced and presented. This first few times I offer a “Choose Your Challenge” assignment we have a whole class discussion about how some topics with come more easily than others for them, and those strong topics they experience will be different for different students at various times throughout the year. It’s important that they challenge themselves at a level that is helping them best learn. On average 10-20% of students in my standard math classes take on the challenge assignment. That percentage tends to be higher when I offer this opportunity in my accelerated classes. I should note here that I work in a very high achieving public school district in Massachusetts where it is “cool” to be in accelerated and our students, in general, are very hard workers. Developing reflective learners has been a goal of mine for a few years. I am very happy with everything that I have learned and incorporated in my classes so far, but I would also love to hear what other teachers are doing to promote self-reflection in the classroom. I look forward to reading your thoughts below! If you enjoyed this post, be sure to subscribe. 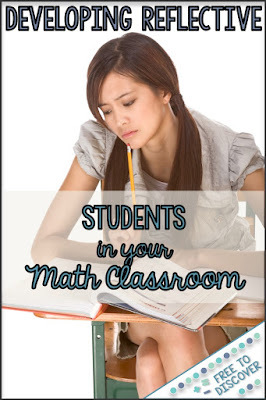 You'll receive a free middle school math resource by email and future blog updates.